Last week-end we rented a power auger...that big yellow machine in the picture. 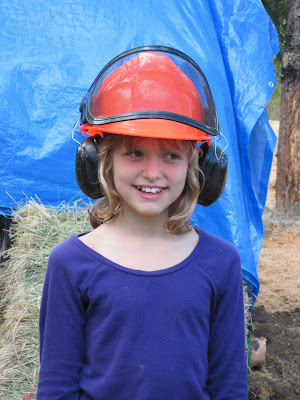 We need to build a hay/woodshed with as many found/scrap materials as possible as we have no budget for this project! 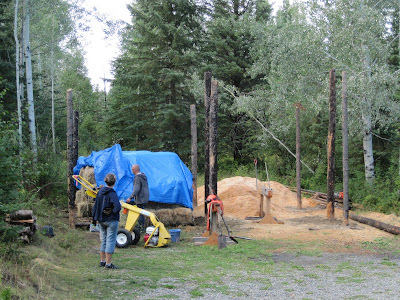 So the upright posts are beetle-kill timber that the hydro people have been cutting down to clear the hydro right of ways, and average about 18 feet long. 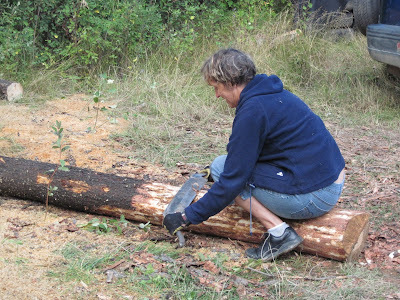 Grandmaman did the 'skinning' of the bottoms of the posts. Erich dug the holes in no time, using the handy power auger, and it took all three of us to get the posts into position in the holes. Next week-end we are hoping to get going on the roof. 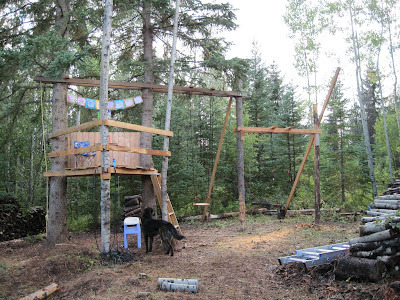 And since we had the auger, we added some poles to the treehouse and made room for some swings.